Abbas threatens to dissolve the PA if peace talks fail again. I personally think its a bluff to pressure Israeli's back into a talk. If in the case that the PA is dissolved, Israel would have to assume military control of 2.2 million Palestinians in the West Bank. While writing my paper, I came across couple articles that argue that Islamic banking in the GCC shielded their economies to a certain extent from the full brunt of a global financial meltdown. Islamic banking, has different regulations, such as: “asset-backed and no-interest investments and prohibiting dealing in activities that Islam deems unlawful.” And now it’s growing in popularity. Keep in mind though a global recession reduces the demand for oil, which is the majority of exports for most GCC states, except for Emirates and Kuwait who have diversified their economies, from just relying on oil exports. I think the game peacemaker is very useful tool that allows individuals to understand the complex political nature of Israel and Palestinian Authority. After playing as Prime Minister on both sides I really learned how hard it must be to come to agree on staring negotiations. As prime minster you have to really juggle different interests, in some cases extreme ones like Hamas and the Yesha. I started off by playing as the Palestinian Prime minister and failed the first two times. I played on the tense level setting for both as Israeli PM and Palestinian PM. I started off the game as the Palestinian Prime Minister and quickly started the third Intifada. Then I decided on a strategy of to negate or reduce the political sway of Hamas by funding social services like health care and education. Sounded like a good plan until I realized that I needed to get funding from the UN, US, EU, the Arab states or Israel, and it was difficult get funding sometimes. Another strategy that I attempted to use was to use the least amount of force as possible, so I would send police officers but just to patrol. Of course when I did get funding I would fund different education, health care, infrastructure programs. In addition to all that I would also try to pressure Israel from a third party such as Jordan or the UN. Some how I managed to reach a peace agreement, I was pretty happy! At the end it said I had an average violence score of 67. That kind of reminded me of what we had discussed in class that to reach a peace agreement both sides need to feel the pressure to push forward the negotiations. Playing as the Israeli Prime Minister was far more difficult. I read someone else’s post saying that it was really easy, i’m not sure how. But there were so many more ways to respond to an incident. The biggest problem I had was figuring out a way to keep both sides happy. I felt like it was just impossible for me to find a way to increase points on both sides. I played several games and it swirled out of control into the third intifada. So at the start of my like 7th game I decided to build new settlements that increased my score on the Israeli side by only +8 while that dropped my score on the Palestinian side to -71. After the violence started I felt like I couldn't find anything at all to make the Palestinians happy, If I attempted to give aid it wouldn’t pass or the Palestinians would just respond by saying maybe Israeli shouldn’t use violence. After trying to play as the Israeli PM for like 10 times I gave up. I came out of the game feeling like it would be impossible to satisfy the wide spectrum of Israelis. This reminded me how we had discussed that most government in Israeli are made up of coalitions. All in all I think the game is a great learning tool, allows people to really understand how difficult it is to maneuver towards a peace agreement. I totally agree with President Obama's comments on how this decision will complicate peace negotiations in the future. Decisions like these make me wonder, what the real motives of Israeli politicians are. In the article it says the decision came at this time because of bureaucracy. Decisions like these make me wonder if Israeli really wants peace. Nasser's Vietnam, Rise of Saudi Arabia? 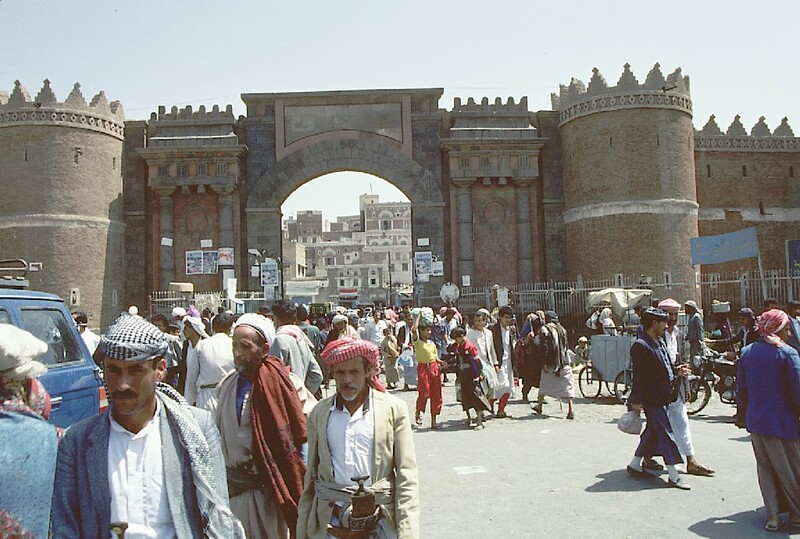 I lived in Yemen from 1997-2000, and since then I’ve had a special interest in Yemen. I think, the early exposure to Yemen is a factor that has continued my interested in the Middle East. Except for the occasional mention of Yemen in relations to the growing al-Qaeda activity and terrorist plots like the USS Cole bombing in 2000, there is really no media coverage of what is occurring in Yemen. Recently, the situation in Yemen has become really dangerous. Earlier this year the United States decided to close their embassy because of security reasons. Yemen is currently facing two separatist movements, one in the North (The Houthis) and in the South. Yemen is an amazingly beautiful country. I’m kind of disappointed that I didn’t really appreciate the history of Yemen when I was there, in my defense I was only 8 years old. I feel like some of the places in Yemen have not changed for centuries, like Bab al-Yemen (Yemen Gate) is more than 2,500 years old. Its an old fortress city, you enter through these gates. But inside except for the sporadic Toyota pickup trucks loaded with goods. This old city is criss-crossed with narrow alleyways and hundreds of old shops. The specie suq looks/feels like nothing has changed since the 15th century. Not to mention how everyone stuffs their checks with Khat. But what I want discuss in this blog is the North Yemen Civil War from 1962 to 1970, and its ramifications for Nasser and Egypt in relation to the power struggle with Saudi Arabia. It seems like the North Yemen civil war was a foreshadowing of the power shift that was to occur in the 70s. 1) There are the Royalists who controlled Northern Yemen for thousands of years, under an Imam. They happen to be a part of a branch of Shiia Islam (Zaidi). Zaidis are generally considered moderate in their stance and similar to Sunni Islam; their jurisprudence is quite similar to the Hanafi School. 2) Saudi Arabia and Jordan supported the Royalists throughout the conflict, and eventually the United States gets involved, minimally. Saudi Arabia provided the Royalists with military aid, weapons and ammunition. 3) Egypt was supporting what would become the Yemen Arab Republic. Individuals inspired by Nasser and the UAR (United Arab Republic) lead a coup in 1962 that overthrew the Imamate (the Royalists). The Soviet Union would also become involved in supporting Egypt during the war. 4) Southern Yemen or the People’s Democratic Republic of Yemen (PDRY) was controlled by the British until 1969. But groups like Front for the Liberation of Occupied South Yemen (FLOSY) and the National Front (NF) were fighting the British for independence. The British supported the Royalists and the Saudis against the republicans and the Egyptians. I also came across a really interesting character named Bruce Conde served in the U.S. army in North Africa during World War two. However, what makes him interesting is that he was pen pals with Muhammad al-Badr who was the Imam’s son (Royalists). Conde as a child used to collect stamps and he wrote to the Imam at the time to send him local postage stamps for his collection. Conde spent a lot of time in the Middle East traveling and learning Arabic. In 1962 he went back to Yemen where he renounced his American citizenship, converted to Islam and became a General in the Royalist resistance. Conde sounds kind of crazy, he was trying to trace his family linage to the moors in Spain and some how make it seem as though he was actually an Arab. He ends up dying in Morocco, without any citizenship. Seems like an interesting guy. In 1832 the British East India Company established a coaling station in the port of Aden for ships traveling to India. India was the crown jewel for the British and a lot of British motives in the Middle East were driven by their need to have secure trade paths to India. 1839 Aden became a protectorate, in order to reduce the amount of piracy in that region. The Ottomans and the British established a border in 1904. Under the Aden protectorate there were several different tribes that ruled, under the British. The collapse of the Ottoman Empire leads to the creation of the Mutawakkilite Kingdom of Yemen (North Yemen) in 1918. This area was ruled about the Shiite Muslims, the Zaydi. The Ottomans had pretty much retreated from Yemen in 1913, shortly before World War I. In 1926 Imam Yahya proclaimed himself the king of the Mutawakkliite kingdom of Yemen. Yahay did not recognize Southern Yemen as controlled by the British. He was killed in 1948 during a coup and was replaced by his son Ahmad bin Yahya. Ahamad Bin Yahya’s son Muhammad Al-Badr became the king in September 16th in 1962, and would be the leader of the Royalist resistance against Republicans and Egyptians. The coup occurs in September 1962, the Republicans deposed the King Muhammad al-Badr. The ironic thing is that al-Badr was a fan of Nasser and had hoped to develop good relations with Egypt to help Yemen modernize. However Egypt was already funding the Republicans to overthrow his government. The first nation to recognize new Republic was the Soviet Union they also claimed “Any act of aggression against Yemen will be considered an act of aggression against the Soviet Union." Latter on Southern Yemen would cultivate a good relationship with the Soviet Union. After 1956, Nasser was really popular and he became the president of Egypt and Syria, under the UAR. He started to crackdown on Syrian communists and opponents of the union. He filled a lot of the political roles with Egyptians. This created was strong resistance to the Union in Syria; Syrian Bedouin were funded by Saudi Arabia to fight off Nasser. As Nasser started to realize the collapse of the UAR, he pushed for Yemen to be part of the Union. Nasser had always disliked British involvement in Aden, and also wanted to secure the entire length of the Red Sea. He was sure that a short engagement with the Royalists would quickly help establish the Republicans in Yemen. He might have also been bitter about the quick dissolution of the UAR, and Saudi royals funding the resistance in Syria. In response to Egypt accepting Yemen into the UAS, the British in 1959 quickly formed the Federation of Arab Emirates of the South, which consisted of the several tribes in Aden. 1963 the British pushed for all of Aden to become a large nation called the Federation of South Arabia. The British also wanted to keep a foothold in the Region. Saudi Arabia funded the Royalists because of their fear of the spread of war into Saudi Arabia and the eventual take over of their oil fields; King Hussein of Jordan also shared this fear. The United States were concerned more about the grand scheme of things. Nasser was part of the non-aligned movement but after the 1956 Suez crisis it was clear he was playing both sides. John F Kennedy tried to negotiate with all the parties involved, except Nasser said he would pullout only if Saudi Arabia stopped support for the Royalists. The United States flew jets over Riyadh and Jeddha multiple times to show U.S. support for Saudi Arabia, and to threaten Egypt. The United States eventually does recognize the YAR in December 19th 1962. Operation Hard Surface (drafted by McGeorge Bundy and Robert Komer) was to trade American protection (or the appearance of it) for a Saudi commitment to halt aid to the royalists, on the basis of which the Americans would get Nasser to withdraw his troop from Yemen.‬ However this plan was not accepted by King Faisal. The war was very costly for the Egyptians. Until 1967 Nasser made comments like "we will stay in Yemen for 20 years if necessary.” However, the Egyptians were really feeling the pinch. By 1964 Egypt had 50,000 troops in Yemen. He had initially thought that the operation would have only taken 3 months but it dragged on for 5 years. Egypt had run up a foreign debt of $3 billion dollars. By 1964, Egyptian casualties had reached over 10,000 troops. The start of the six-day War Nasser was required to pull back 15,000 troops from Yemen. There were several conferences between Faisal (king of Saudi Arabia) and Nasser, they would result in an agreement on withdrawal but the conflict continued. Saudi Arabia slowly started to stop supporting the Royalists, because the Egyptians just could not handle funding the Republicans anymore. The war finally ended in 1970 where the Republicans took over and “integrated” the Royalists. The British left Southern Yemen. Then the talks about unification between North and South Yemen began. It was not till 1978 that we see Ali Abdullah Saleh gain power (ironically he also he a shiia Zadi). By the way he "democratically elected" and he's been president since 1978. There also a civil war in 1994 between North Yemen and South. Its kind of Ironic that right now Saudi Arabia bombs and kills Houthis in Northern Yemen but these were the same people Saudi Arabia funded during the North Yemen Civil war. This article looks at the current situation with Houthis in Yemen. It was interesting to do this research after today’s class because it made it seen as though that Yemen became the country that suffered because of the conflict between Egypt and Saudi Arabia. Professor Webb said that one of the large changes of the 70s in the Middle East was that shift of power from Cairo to Riyadh. It seems the North Yemen Civil war was a testing ground for both countries, maybe a precursor to what was to come as Saudi Arabia’s ascension to power. An interesting book, but hard to find is Yemen The Unknown War – Dana Adams Schmidt. It has a lot of first hand accounts from Bruce Conde. This is a really interesting video where Iian Pappe who is a professor at the college of Social Science and International Studies at the University of Exeter in England. He argues that the word "Nakba" does not do justice to what happened in 1948 to the Palestinians, he calls it ethnic cleansing and the man who was the architect of this policy was David Ben-Gurion. This is seems like a very controversial perspective on the topic. This NYtimes article talks about Iran's influence on Karzai and the Afgan government. I've heard allegations of massive amounts of corruption and funding of the opium trade etc. But I was shocked to know that Iran just sends millions of dollars to Karzai and his cabinet routinely. There is no question that Iran is trying to increase it's influence in Afghanistan and undermine American and NATO activities. I know in the past when the United States pressured Karzai for reforms he has responded by trying to establish stronger trade relations with Russia (for arms.) I think a lot of the problems Afghanistan is facing or in terms of implementing new policies are rooted in bad leadership. I think the United States had hoped Karzai would be a good puppet however he has turned out to be more like rebellious teenager. I don't think I have to mention the 2009 elections, where there were thousands of allegations of fraud and poor security at voting booths and intimidation. Is Afghanistan also turning into another Middle Eastern regime? Why is it so hard to find leaders that are truly concerned about their country and their people. This is all to reminiscent of Nepali politics, of course not to the same extent but in terms of leaders lacking any sense of responsibility towards the people.